New life has been brought into Uraidla with the renovations of the Uraidla Hotel. The building dates back to the 1880’s, and the last time any renovation work was done was back in the 1920’s and 1930’s. The historic building has a multitude of rooms, some with nice Art Deco features. One of the new additions is the glass conservatory which offers views across the oval. 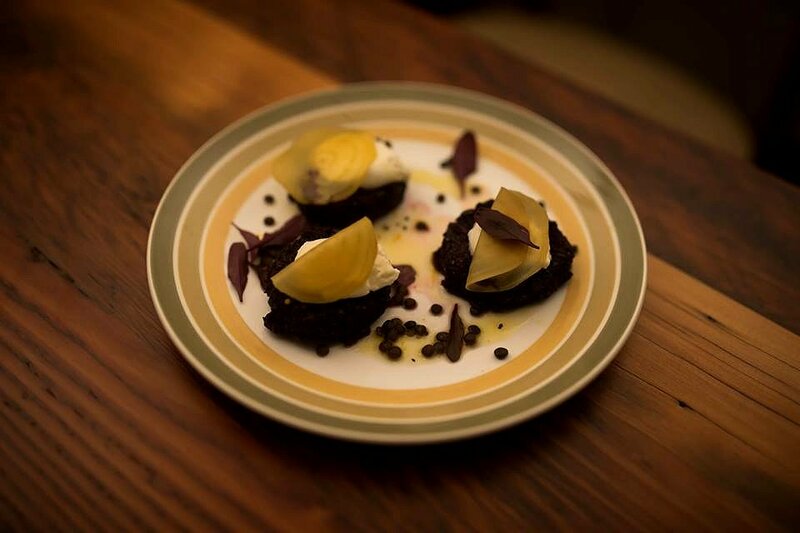 The food would be best described as “river cottage” with the vegetables sourced from within the region and the proteins within South Australia where possible. Adelaide Food Central was invited to preview The Uraidla Hotel prior to opening, with all food and drink being provided free of charge. 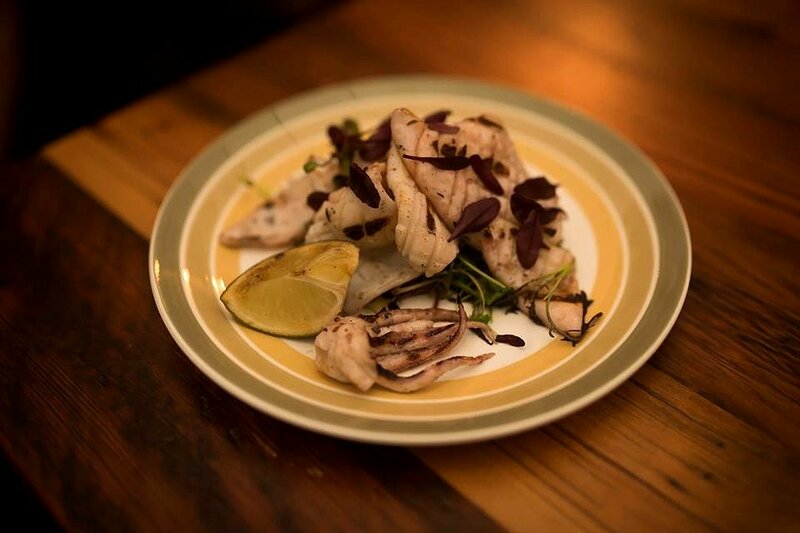 We start off with the Charred Confit Squid which comes with pickled fennel, herb salad and a citrus dressing. The squid was soft and delicate, and had lovely chargrilled flavours throughout. The salad was fresh and crisp, while the sweet and tangy pickled fennel was well balanced by the tartness of the dressing. The dish was light and refreshing. The other starter we had was the Beetroot and Quinoa Fritters with chevre, pickled beetroot, baby chard, orange and cracked pepper dressing. The fritters were soft and delicate, and matched perfectly with the chevre. The pickled beetroot provided a contrast in texture to the dish by adding a slight crunchiness, and its tangy flavour was balanced by the citrus dressing. The first of the mains was the Moroccan Spiced Suffolk Lamb Shoulder with baby carrots, currants, almonds, pepitas, couscous, roasted lemon and yoghurt dressing. 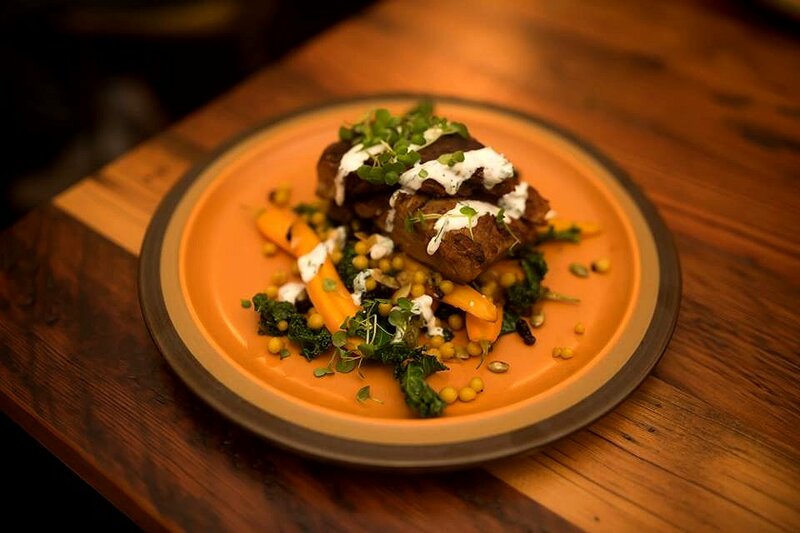 The lamb shoulder was soft and delicate, and you could taste the Moroccan spices throughout the meat. The carrots and couscous were slightly undercooked, but it was a tasty dish all round. 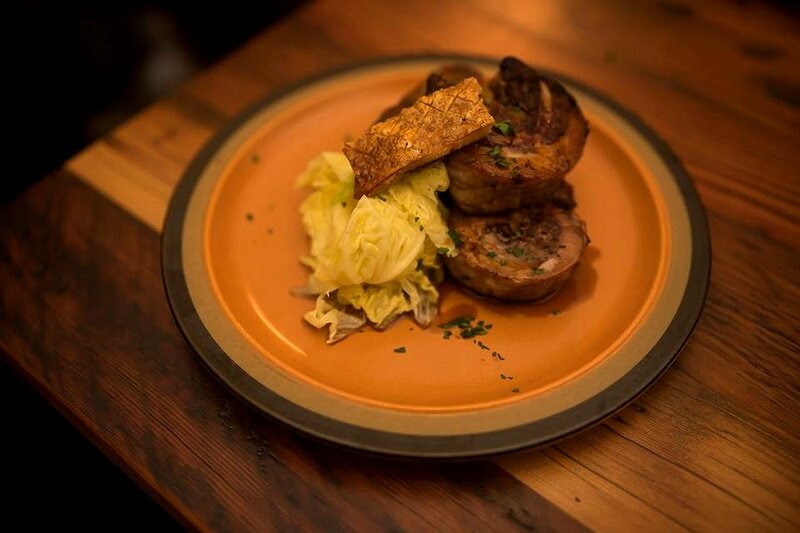 The Berkshire Rolled Pork Belly had orchard stuffing, potato brik, steamed butter cabbage and jus. The first thing we ate on this dish was the crackling. It was absolutely perfect; not too hard with the right amount of crunch. The pork was well seasoned, tender and succulent, and each bite was heavenly. This was perfectly accompanied by the soft, delicate layers of potato brik and the leafy butter cabbage. We were full at this point, but there’s always room for desserts. 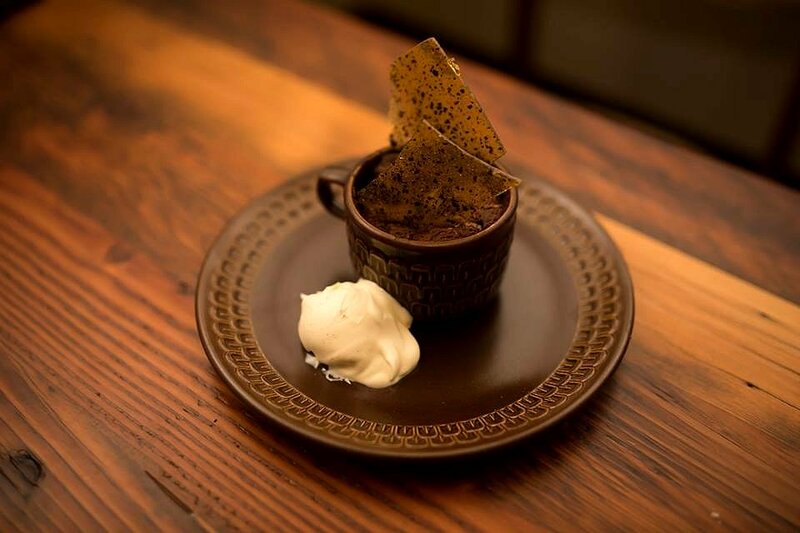 The Self Saucing Mocha Pudding Cup was served with a coffee bean brittle and creme fraiche. The pudding was moist, decadent, and full of chocolatey goodness with a subtle hint of coffee flavour. The brittle was crunchy, and the creme fraiche was soft and delicate, adding good texture contrast to the dessert. 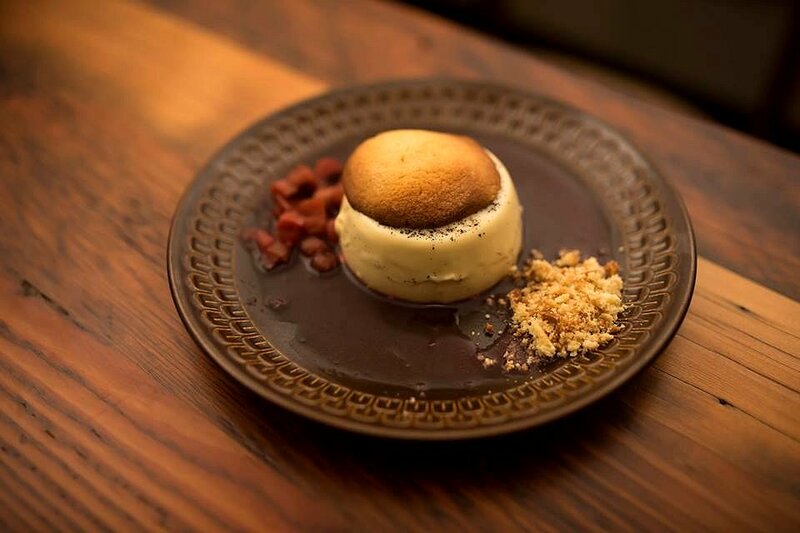 The Vanilla Bean Pannacotta was served with a rhubarb compote and ginger biscuit crumble. A well made pannacotta should be firm and wobbly, and this was just that. The pannacotta was smooth, thick and creamy with the presence of vanilla. The sweetness of the rhubarb compote helped further accentuate the dish, while the biscuit added a nice crumbly texture. Last but not least was the Banana Chip Sundae with vanilla ice cream, salted caramel sauce and whipped cream. 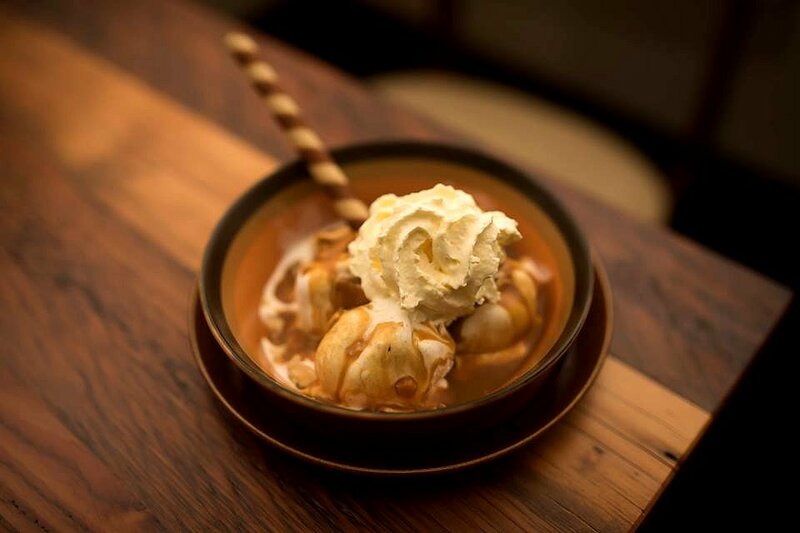 We love a good sundae and this really hit the spot. The dessert comes with a serving of 4 generously sized scoops of smooth and creamy vanilla ice cream. The banana chips add a crunchy texture as does the wafer stick, and the salted caramel slightly balances the sweetness of the ice cream. The newly renovated Uraidla Hotel is great for both locals and the region. The produce is sourced locally, as are the staff, which is all part of giving back to the community. The food we had was delicious, and we were literally rolling out of there by the end of the night. The atmosphere was cosy and relaxed, and the service was great too. The Uraidla Hotel is unique in many ways, and you’ll certainly feel like part of the family when you come up here.